Kia Sorento vs Land Rover Discovery Sport vs Hyundai Santa Fe vs Nissan X-Trail | What Car? So, you need seven seats but you don't want an MPV. It's one of the most popular questions we get asked here at What Car? Well, unless your budget stretches beyond £45k, these four SUVs are likely to be on your shortlist. Two of them – the classy Kia Sorento and the ultra-desirable Land Rover Discovery Sport – are brand new, and we're about to find out if they can beat established favourites the Nissan X-Trail and Hyundai Santa Fe. Freelander replacement is great to drive. Is it practical enough? The cheapest and best-equipped. No automatic gearbox if you want four-wheel drive, though. Three of these SUVs are available with a choice of manual or automatic gearboxes, but the Nissan forces you to have a manual ’box if you want four-wheel drive. The X-Trail also looks decidedly underpowered; its 1.6-litre diesel engine produces just 129bhp, compared with around 190bhp provided by these rivals’ 2.2-litre engines. So, it’s hardly surprising that the Nissan was slowest of the four in all of our acceleration tests by some margin, and is the only car that starts to struggle with the weight of seven people and their luggage. Relatively short gearing helps to some extent, but means you have to change gear regularly to keep the engine in its sweet spot. That said, the Nissan is capable of pulling braked trailers of up to two tonnes, which is a match for its two Korean rivals and only slightly down on the Land Rover’s 2.2-tonne maximum towing capacity. The three 2.2-litre cars offer very similar performance across the board, pulling strongly from around 1700rpm and accelerating from 30-70mph similarly briskly. Meanwhile, the six-speed automatic gearboxes in the Sorento and Santa Fe are fairly slow to change gear, but respond snappily enough to kickdown requests. The Land Rover’s nine-speed gearbox shifts more positively in normal driving, but dithers when you ask for a sudden burst of acceleration – when pulling out of junctions or roundabouts, for example. Comfort is the priority here, but sloppy body control and unruly handling aren’t acceptable compromises in a modern SUV. The Sorento strikes this balance pretty well. At high speeds it wafts along in a relaxed and comfortable fashion, and its fairly soft suspension copes well with larger obstacles, such as speed bumps, around town. Things are a little unsettled over patched-up urban roads, although the fact that our test car was fitted with 19-inch alloys (standard KX-2 models have 18-inch rims) would have had something to do with this. As you’d expect, the Sorento doesn’t scythe through corners like a hatchback, but neither does it lurch around wildly. It grips well, too. It’s just a pity the steering is vague and unnaturally weighted, because this takes the gloss off what would otherwise be a very pleasant driving experience. The Santa Fe shares many of its nuts and bolts with the Sorento, and the similarities – in particular the vague steering – are immediately apparent. However, the Hyundai doesn’t ride quite as smoothly as its Korean sibling and sways about a bit more through corners. Meanwhile, the Nissan’s firmer suspension means you’re always more aware of bumps passing beneath the car than in either of the Korean cars. The ride never becomes too jarring, though, even along seriously rutted roads, and the Nissan is marginally more agile than the Kia and Hyundai. It steers more accurately, too, giving you that bit more confidence along twisty country roads. As its name would suggest, the Discovery Sport is easily the most nimble of the four. It sways around far less than its rivals through tight twists and turns, and grips harder. Its quick, accurate steering also lends the Land Rover an air of agility without making it nervous. There is a drawback, though: the Discovery is the least comfortable of the four around town, where its firm suspension jostles you around over every little imperfection; as with the Kia and Hyundai, our test car was fitted with optional 19in alloys. Things improve significantly as you pick up the pace, though, and the Land Rover actually has the most comfortable motorway ride of all of these SUVs. Getting comfortable in the Hyundai is easy because there’s a wide range of manual seat and steering wheel movement, while electric lumbar adjustment is standard across the range. KX-2 Sorentos miss out on lumbar adjustment but, as with the Santa Fe, there is at least a good range of manual seat and steering wheel alteration. The Land Rover also does without electric seats or lumbar adjustment (you can have both but it’ll cost you £420). However, its driving position is otherwise tough to fault and drivers of most shapes and sizes will find it easy to get comfortable. In this Tekna guise the X-Trail gets electric seat movement, including lumbar arrangement, as standard. The Nissan’s seats aren’t quite as comfortable as the Land Rover’s, but still provide enough support in all the right places. Seeing out of all four cars is similarly easy when you’re looking forwards; all have thin front pillars and tall, wide windscreens to accompany their raised driving positions. However, the over-the shoulder view is more obscured because of their thick rear pillars and shallow rear screens; the Kia is best and the Hyundai worst. The Sorento’s dashboard is also the easiest to get to grips with. It has the simplest climate control system, followed by the Nissan’s. The Hyundai and Land Rover have slightly less intuitive and buttonheavier interfaces but don’t take too long to get the hang of. All four cars come with Bluetooth for making handsfree calls on the move plus a USB socket for charging your phone and playing music stored on it through the stereo. Each car also has steering wheel-mounted audio controls. The Hyundai is alone in missing out on a DAB radio, while the Sorento is the only car in this test to make do without a CD player. Meanwhile, Land Rover is the only maker not to include sat-nav; the only way to get one is to upgrade to SE Tech trim, which adds £1500 to the price. The Land Rover’s 8.0in colour touchscreen is slightly larger than the 7.0in displays in its rivals. However, bigger doesn’t always mean better, because the Discovery Sport’s system isn’t any more responsive than the ones in the Hyundai or Kia. The on-screen menus and surrounding buttons are similarly logical in all three cars, so you won’t having any problem navigating the systems. The Nissan’s Connect system is actually the most responsive of the four, but some of the on-screen buttons are too small and too close together, and the same goes for the surrounding shortcut buttons. The X-Trail system can also sync with an app on your Smartphone, allowing you to get social media updates and make internet searches. Land Rover also offers an app that can check the car’s status (fuel level, location) remotely, and make emergency calls to Land Rover Assistance. The Santa Fe and Sorento offer no app integration at all. You won’t find a hard drive for storing music and photos in any of the four. In fact, only Land Rover offers further infotainment options, including an upgraded sound system (£200) and four additional USB sockets across the two rear rows (£200). The top and face of the Kia’s dashboard is covered in dense, soft-touch plastics, while its switchgear is nicely damped and its chrome accents give a welcome lift to the dark grey ambiance. The Discovery Sport’s interior feels similarly well screwed together, and its plastics and surfaces look and feel even more upmarket. Its rotary dials and buttons also have a solid, nicely damped feel; it’s very impressive in the company of these manufacturers. The Hyundai’s interior doesn’t have the same air of class. It’s sturdy throughout, but there are poorer quality plastics lower down on its dashboard and some of its silver highlights look and feel tacky. The X-Trail’s interior is largely borrowed from the smaller Qashqai, but don’t expect higher quality from the bigger, more expensive Nissan. As in the Hyundai, everything feels pleasingly solid, but it’s functional rather than fancy. The gloss black finish on the dashboard and generally softer-touch materials just give it the edge over the Santa Fe for outright quality, though. None of these models featured in the most recent JD Power ownership satisfaction survey, but Hyundai was the most reliable of the four manufacturers here, finishing third out of 26. Kia wasn’t far behind in fifth, while Nissan’s ninth position was far from shameful. Land Rover’s 21st place was less impressive. The X-Trail Tekna gets all the essentials, plus an opening panoramic sunroof, a reversing camera and a self-parking system that can automatically steer the car into a space. You also get LED headlights and keyless go – all items that are either optional or not available on the other cars. The Kia and Hyundai both offer plenty of kit, though, including heated seats in the front and back and faux leather upholstery, but you can’t add any options apart from metallic paint. The Discovery Sport is low on luxuries in this company, but it’s still reasonably well equipped. Part-leather upholstery, rear parking sensors and cruise and climate controls are all included, and you have the broadest range of colours to choose from, including a contrasting roof. Kia and Hyundai both offer white as the only standard colour, but the Santa Fe is available with a couple of bright colours, where the Sorento’s palette is resolutely monochrome. Nissan offers red as the only no-cost colour, and has a decent range of optional paints. The Kia and Hyundai look decidedly short of safety tech. Both come with a tyre-pressure monitoring system, but you can’t even add automatic emergency braking or lane-departure warning – things that the Nissan and Land Rover get as standard. The Nissan goes further still; it displays the speed limit of the road and warns you if there’s something in your blindspot. The only thing it doesn’t get that all the others do is trailer-stability assist – a function that adapts the electronic stability control to respond if an attached trailer starts to weave. All of these cars were awarded five-star ratings by safety body Euro NCAP, but the Land Rover fared best for adult occupant protection, while the Hyundai was tested under older, less stringent test conditions. Both the Land Rover and Hyundai get a driver’s knee airbag and the Discovery goes even further with an external airbag to cover the windscreen and upper bonnet area to cushion any impact with a pedestrian. The new Sorento has close ties with the Santa Fe, so you’d imagine the two cars would be similarly refined. Not so – the Kia’s engine is noticeably smoother and quieter. It’s still a bit clattery at idle, but not as harsh under acceleration, and you feel a bit less vibration through the steering wheel and pedals. Drive along any battered backstreet and you’ll also notice less suspension noise in the Kia, although more wind noise filters into its cabin at 70mph. The Discovery Sport will get a new 2.0-litre diesel engine in the next few months. That’s a good thing because the 2.2-litre in this version (carried over from the Freelander) is gruff at low speeds and sends too many tremors through the pedals. The Land Rover isn’t the most refined SUV in other respects, either, because there’s more road noise than in any of the other three cars, and similar wind noise to the Kia. However, the Discovery Sport is positively hushed compared with the X-Trail. Most of the blame lies with the Nissan’s diesel engine, which clatters away noisily at idle and emits a unpleasant snarl at higher revs. It also sends far too many vibrations through the pedals and to the soles of your feet. There’s less road noise than in the Land Rover, but comparable amounts of wind noise. At least there isn’t much wrong with the Nissan’s manual gearshift - it’s relatively slick and accurate. The Kia and Hyundai’s auto ’boxes blur changes with suitable smoothness, and while the Land Rover’s nine-speed auto is a little jerky at low speeds, it’s never enough to be irksome. Even tall adults will find it easy to sit comfortably in the front of any of these SUVs. 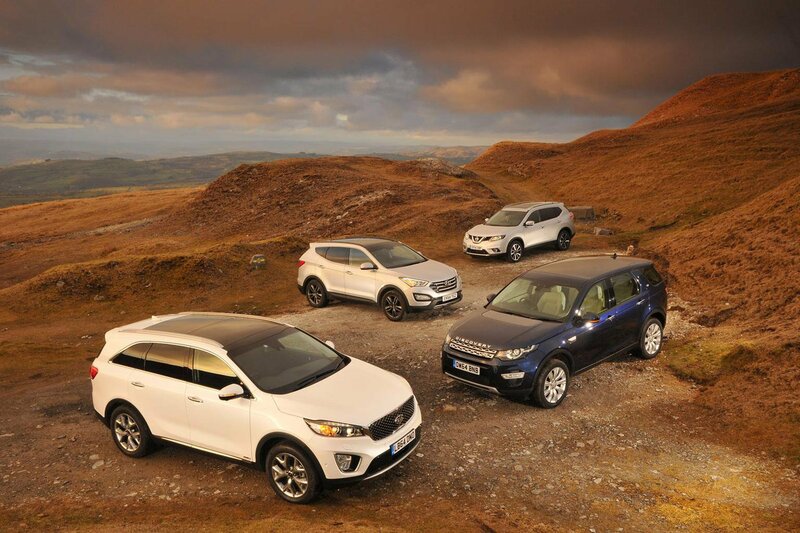 Ultimately, the Discovery Sport has the most head room, followed closely by the Santa Fe. Headroom in the Nissan and Kia is comparable, even though our Sorento test car was hindered slightly in this respect by its panoramic roof, which doesn’t feature on standard KX-2 models. Two adults will be able to sit comfortably in the middle row of all four SUVs, but three adults will have most shoulder room in the Sorento. That said, the Santa Fe’s cabin isn’t much narrower and, like the Kia’s, its floor is flat with no transmission tunnel eating up foot space. The middle-row seats in all of the cars are split 60:40. They can be slid back and forth as required, and their backrests reclined. Although the third row of seats in each is best reserved for children, the Sorento stands out as the best for carrying adults on short journeys. Knee room is noticeably better in the Kia than the other three cars. That said, the X-Trail has a bit more headroom. The Santa Fe is next best for leg room, followed by the X-Trail, while the Land Rover’s third row is the most cramped to sit in and the trickiest to access. The Sorento has the biggest boot, and it’s also the widest overall, which makes loading broad, bulky items much easier. Each car’s third row of seats folds away leaving a flat, extended load bay. The middle-row backrests can be folded in each car, too, giving a vast load area. In two-seat mode the X-Trail’s boot floor is flattest, although there’s only a slight angle to the floors of the other cars. The Nissan is the cheapest to own, no matter if you’re a private cash buyer or a company car driver. The X-Trail will be £1400 cheaper to buy outright after discounts, with the Hyundai next cheapest after haggling. While the list prices of the Sorento and Santa Fe are similar, the Kia’s just-launched appeal means savings are smaller, so it’ll cost you an extra £1330 to buy. Still, at least there are small savings to be haggled – more than can be said for the discount-free Land Rover, which is the priciest by £1715. Where the Discovery Sport excels is in its strong resale values, which save it from being the most expensive to buy and run if you sell on after three years and 36,000 miles. That dubious honour goes to the Kia, with the Hyundai only fractionally cheaper. The Nissan is cheapest for those buying on finance, too. Put down a £5000 deposit on a three-year PCP The Nissan will cost a 40% rate taxpayer £9620 in company car tax over the next three years, which is £3000 less than the Discovery Sport over the same period, £3550 cheaper than the Santa Fe and £3600 cheaper than the Sorento. In fact, the only way the Sorento won’t cost you the most is if you’re leasing when, surprisingly, it’ll actually cost you the least (£349) every month. Meanwhile, the Nissan will cost you £368, while the Hyundai comes in at a much stiffer £447 and the Land Rover an eye-watering £485. It's a sign of how relatively little there is to split these four SUVs that, despite the similarities between the Kia and Hyundai, it’s these two cars that bookend the running order. The Sorento fully deserves the victory, though. It’s the biggest and most practical, which counts for a lot, but it’s also the most refi ned and the most comfortable. The way it drives is unlikely to excite you, and it’s a shame the Kia’s engine isn’t a little more effi cient, but the smart and user-friendly interior more than makes amends. That said, we can certainly see why you’d be seduced by the Land Rover’s more premium image, sharper handling and better safety provisions. Yes, it’s the least practical of the four, the most expensive and delivers the worst real-world fuel economy. That high price has to be offset against the Discovery’s slow depreciation, however, while a new diesel engine due later this year should take care of the fuel economy issues and, hopefully, also improve refi nement. In fact, if you can wait a few months, the Land Rover may even prove a better buy than the Sorento. Third place goes to the X-Trail. It’s the cheapest, no matter if you’re a private buyer or a company car driver, and also comes generously equipped. It’s very noisy, though, and performance is decidedly pedestrian in the company of these larger-engined SUVs. The Santa Fe isn’t disgraced. It has many of the Kia’s virtues, including its size and a strong engine. It isn’t as good to drive or as smart inside as its Korean sibling, though.